Even though the current arc is filler, it has to be one of the most enjoyable filler content in the Boruto anime yet. ‘Melee!’ showed our heroes doing everything possible to defeat their enemies. I can’t wait for the finale! The previous episode had Boruto and the rest in a tough situation because their opponents were able to see through their plan. And while Boruto and Suigetsu are still in danger, it was amazing to see Karin, Salad, Sumire, Wasabi, and Namida (yay! girl power) being able to come up with strategies to take down their enemies as fast as possible. It wasn’t easy, but they were able to do it. I don’t know about you, but I’m a fan of Sumire as a character. Her fight with one of the evil twins was a treat to watch even though it was clear she wasn’t a match for her opponent’s brute strength. The current arc has hinted at Sumire having trouble controlling Nue. While I don’t want Nue to go away, I wouldn’t be surprised if Sumire decides to give Nue to Jugo for her powerful summoning to absorb extra chakra from him. I liked how Sumire wasn’t comfortable with using chakra from her friends to help Nue grow. Sumire has experienced a lot. She was raised as a child to be a weapon of mass destruction. I have enjoyed seeing her develop as a character. As for Karin and Salad, the two had an enjoyable fight scene in ‘Melee!’ against a powerful enemy. Due to the type of abilities Karin has a ninja, she can only offer support during battle. And amazing support is exactly what she gave Salad. Karin used her sensory nature to keep track of the enemy’s movements. She also used her chakra chains to trap the enemy as well as heal Salad. I liked Karin complementing Salad’s brute strength and mentioning how similar the young ninja was to Sakura. Whether you like or dislike Sakura Haruno as a character, when it comes to brute strength (in base forms) even Sasuke and Naruto don’t come close to the damage she can do. With the evil twins defeated, the fight is still far from over. Karin and Salad decided to make sure none of the infected geese are able to fly away. Konohamaru and Mistuki went to stop the researchers from the Land of Rivers from causing more damage. 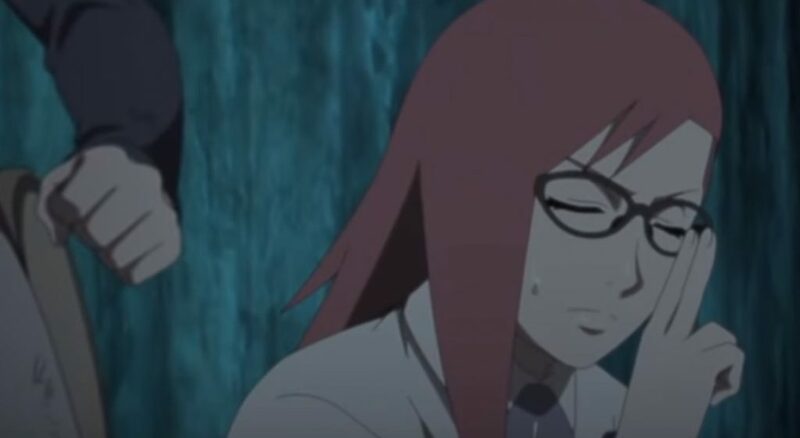 With Tosaka having injected himself with a “perfected” version of Jugo’s Curse Mark, it will be interesting to see how Boruto and the rest are able to take Tosaka down for good. What did you think of Boruto this week? Did you enjoy ‘Melee!’? Let us know.